Big Backyard develop affordable and high quality backyard play systems, where children can play, be active and develop socially and physically with friends and siblings. The unique play features help expand their imaginations, and improve body strength and coordination, in a safe environment. With emphasis on the quality of the material sourcing, testing and manufacturing, Big Backyard aim to supply excellent value to their customers. We work hard to provide quality at affordable prices throughout every aspect of our company, from product development, material sourcing, quality testing, through to our consumer relations department. Our aim is to develop products that allow children's imaginations to grow in a safe and playful environment. Every time a child plays on a Big Backyard Play Set the door to imagination, creativity and endless hours of fun is opened! At Big Backyard our dedicated employees are proud to produce safe products that will create years of lasting memories for your children! One of the biggest considerations when purchasing an outdoor play set is the choice of material- every Big Backyard play set is built with one hundred per cent premium Cedar (Cunninghamia Lanceolata) Lumber giving your play set a distinctive look and feel. With its natural beauty and outstanding physical properties Cedar Lumber is the preferred choice for outdoor projects and considered a premium material. The ability of Cedar to bring warmth and character to a backyard project just can't be matched by plastic or other man-made materials. Some of our customers ask why Cedar Lumber feels lighter. There are two reasons for this. 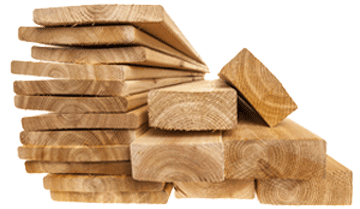 Firstly, Cedar is a soft wood so it is naturally lighter when compared to hardwoods. 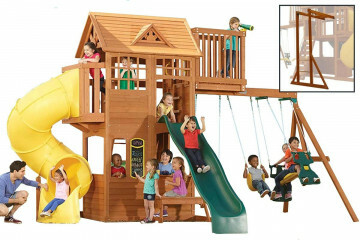 However, the primary reason is that the cedar in your Cedar Summit Premium play set has been Kiln Dried. 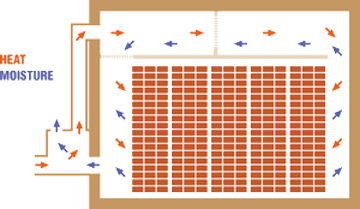 Kiln Drying is a process where the cedar lumber is put into a giant oven over a period of several days removing moisture from the lumber. This makes the lumber more dimensionally stable so the wood will stay flat and straight making it perfect for building a play set. We recommend applying a new coat of water based stain or water repellant annually - to keep your play set in great shape for all the adventures ahead! At Big Backyard safety is our number one priority. We ensure that all of our products meet or exceed safety standards when properly installed. 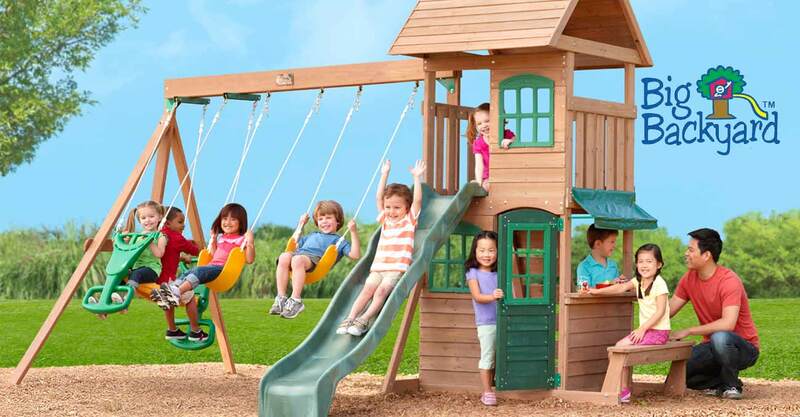 All of our play centers comply with ASTM (formerly known American Society for Testing and Materials) F1148 home playground safety standards. Prior to release each of our products and designs are engineered and tested at great lengths to ensure your children will be safe. 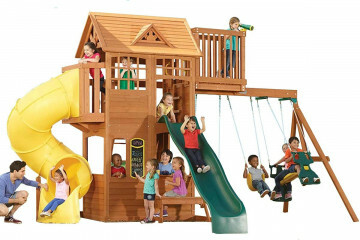 One of the biggest considerations when purchasing an outdoor play structure is the choice of material. 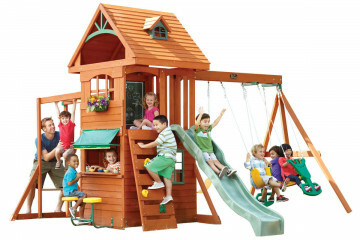 At Big Backyard we are dedicated to providing high quality outdoor play sets and playhouses to our customers. From the lumber to our hardware and accessories we select only the highest quality materials when designing and manufacturing our products. 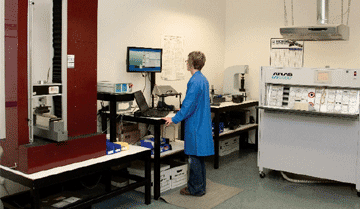 With our experienced product integrity staff, our own QA lab and up to date equipment, we do constant product evaluation and testing to ensure product quality and to support government compliance.